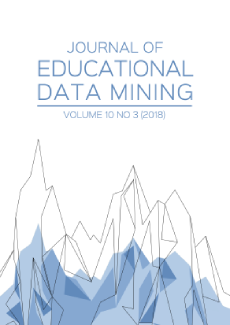 The Journal of Educational Data Mining (JEDM; Impact factor: 3.68; ISSN: 2157-2100) is an international and interdisciplinary forum of research on computational approaches for analyzing electronic repositories of student data to answer educational questions. It is completely and permanently free and open-access to both authors and readers. Educational Data Mining is an emerging discipline, concerned with developing methods for exploring the unique types of data that come from educational settings, and using those methods to better understand students, and the settings in which they learn. Author guidelines and submission guidelines can be found here. All other inquiries should be emailed to: info@jedm.educationaldatamining.org. Although JEDM is not currently indexed, we have calculated the two-year impact factor for 2017 using the Journal Citation Report (JCR) methodology with Google Scholar. Because Google Scholar includes a wide range of publication types, we applied additional criteria of excluding e-prints and technical reports. Even so, our impact factor is more permissive than JCR because it is not restricted to indexed sources.